Twenty one steps – Wait Twenty one seconds – About face. Right shoulder arms. Twenty one steps – Wait Twenty one seconds – About face. Left shoulder arms. Twenty four hours a day, seven days a week, 365 ¼ days a year, a soldier from the Third Infantry Regiment stands watch on the Tomb of the Unknown Soldier in Arlington National Cemetery. While the tomb holds the unidentified remains of soldiers from past wars it is a symbolic reminder of all of those men and women who gave their lives defending American’s way of life. 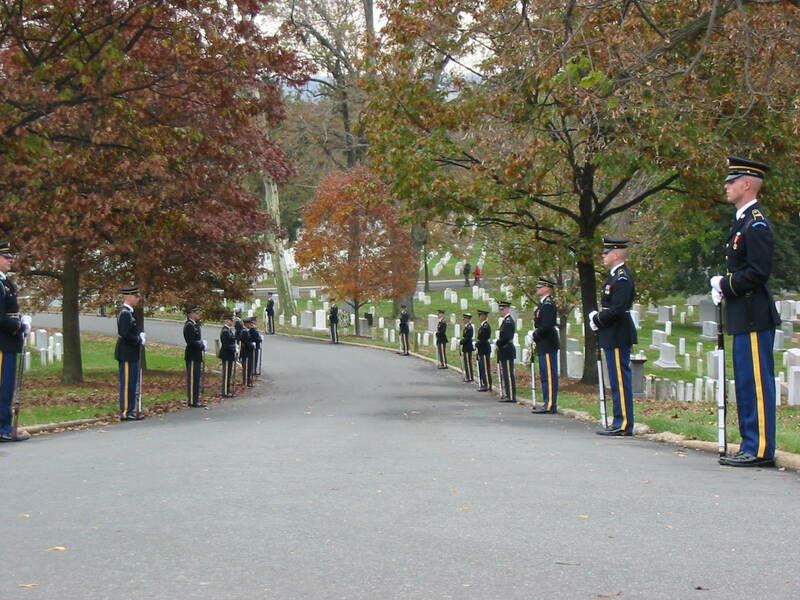 When Hurricane Isabel hit the Washington Baltimore area in 2003, for the first time, the military members assigned the duty of guarding The Tomb of the Unknown Soldier were given permission to suspend the assignment. The Washington Military District Commander, fearing for the lives and safety of the guard advised that they suspend the honor guard until after the storm had passed. The Regimental Commander of the U.S. Third Infantry sent word to the nighttime Sentry Detail to secure the post and seek shelter from the high winds, to ensure their personal safety. Soaked to the skin, marching in the pelting rain of a raging hurricane, they said that guarding the Tomb was not just an assignment; it was the highest honor that can be afforded to a service person. Other troops from the Old Guard volunteered their time off to help the guard at the tomb withstand the hurricane force winds and to ensure that there was an immediate replacement in case the standing guard was injured by flying debris. The tomb has been patrolled continuously, 24/7, since 1930. Some of us fully understand why these young men made this choice, and would willingly make the same commitment. Most people could not conceive of putting their lives at risk for something like the tomb. Then again, most people cannot conceive of putting it all on the line for their country. On Veterans Day, I mark off one vacation day. A benefit of living in the Washington area is that I can easily get from here to the National War Monuments and Arlington National Cemetery. It is about a half hour drive from home to the Washington Metro station at Greenbelt Maryland, then another half hour ride on the Green and Yellow Line trains gets me to Arlington. Veterans Day at Arlington is a bit of an event. The president (whether he is a republican or a democrat) shows up to pay his respects. 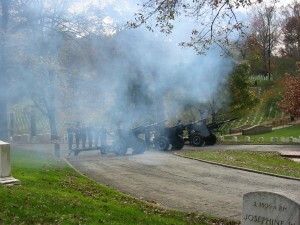 The Old Guard is all lined out in their finest and the ceremonial artillery battery sets up their 105 howitzers in the holler below the tomb of the unknowns. Early November typically sees the leafs on the trees at the end of the autumn color cycle and those fallen leaves make little rustling sounds as they are blown across the lawns filled with precisely aligned white grave markers. Acres and Acres of little white headstones standing for their last formation. The temperatures are typically in the mid-fifties, adding an appropriate chill to the breezes that blow through this hallowed ground. Aside from the gawking tourists, there seem to be two distinct types of visitors at Arlington on Veterans Day. These are little clumps of family groups, come to find the resting place of their father or their mother, their sister or their brother. The men try to stand stoically and observe the final resting place of their relatives while the women quietly fight back the sobs and wipe the tears from their eyes. The other type of visitor is the older veterans like me, typically standing alone and quietly walking from area to area. We stand alone because the emotion of the time and the place is so overpowering that we are afraid that others will see the pain that we feel or our bodies shaking from the emotional overload that we are going through. The quaking in our hearts makes it impossible to speak and we are ashamed that others will not understand the tears on our cheeks. Arriving at Arlington on the Yellow Line, the walk from the Metro station to the entrance of the Cemetery is lined with memorials to some of the most decorated units that have fought in our wars. I have to say that I am unusually proud walking by the 4th Infantry Division memorial and I am absolutely humbled and in awe as I pass the memorials for the 101st and 82nd. I silently walk the path from the entrance and through the thousands of acres of little white headstones to the tomb of the unknown soldiers. If I’m early enough to avoid all of the politicians and pageantry I will silently watch through the changing of the guard. If not, I’ll have to make it back after the president and his gaggle are off the property. Leaving Arlington, I catch a ride over to the War Memorials on the National Mall. Strolling along the black gash in the earth that is the Viet Nam Memorial I stop to feel the names of my own brother and the names of friends who sacrificed all for the American ideals that we were taught in school. And then there is the statue of the nurses, waiting on a medevac with a fallen soldier. This statue always makes me sob. At Arlington and at the Viet Nam Memorial, my entire being is wracked and torn by the emotion of where I am and what it means. My body is shivering, not from the cold, but from being overwhelmed by where I am and why I am here. That I am here and others are not. My voice no longer works and my cheeks are covered with tears. There are a lot of ‘American’ Companies and ‘American’ Workers that choose not to honor Veterans Day to remember our heroes and our fallen – I understand. In fact, I would prefer that you not have the day off. If Veterans Day means barbecues, and public displays by petty politicians then it just dirties and dishonors the valor and sacrifice made by those that the day is set aside to honor. Please have the integrity of removing your silly little “Support our Troops” ribbons from your cars because you clearly don’t comprehend what that means, and don’t even dare to talk to me about how “we” earned our freedoms or “our” right to vote because you don’t have a clue. Twenty one steps. Wait Twenty one seconds. About face. Right shoulder arms. Twenty one steps. Wait Twenty one seconds. About face. Left shoulder arms.